With easy access to major thoroughfares like I-470, U.S. 50, M-150 and M-291, all of the impeccable dining, shopping, entertainment and recreation of the Kansas City metro area is easily accessed by residents of Lee’s Summit, Missouri. Lee’s Summit is an outstanding suburb and for good reason has been named one of Missouri’s “Top 10 Happiest Places.” Located southeast of Kansas City, Lee’s Summit is in both Cass and Jackson counties on 65.87 square miles. This pedestrian friendly city is a great place for families and is served by several truly remarkable school districts. Sports fans love calling Lee’s Summit home because of its close proximity to the Kansas Speedway, Sporting K.C., Kauffman Stadium (home to the Kansas City Royals) and Arrowhead Stadium (home to the Kansas City Chiefs). Other nearby attractions include the Worlds of Fun and Oceans of Fun amusement parks, the Kansas City Zoo and Legoland Discovery Center. 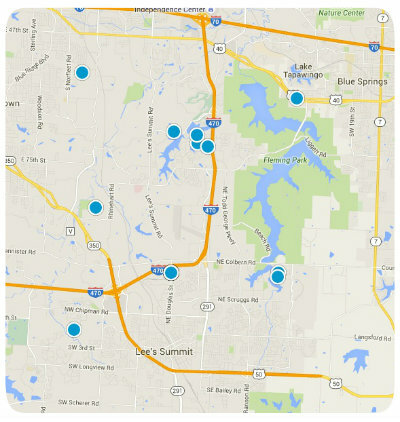 Lee’s Summit also has a great parks system with numerous scenic parks for residents to enjoy throughout the city. With all of these remarkable features and advantages, it is no wonder so many choose to call Lee’s Summit home. Homes for sale in the area include condos, townhomes and single family homes of all styles. Lee’s Summit has a plethora of impressive subdivisions and neighborhoods within its borders, including lakefront communities, golf, gated, and master-planned communities as well. One of Lee’s Summit’s most prestigious communities is that of Sterling Hills. Sterling Hills is northwest of the 3rd Street and Pryor Road intersection, on the west side of Lee’s Summit. This gorgeous neighborhood was first developed in 1993 and is home to 250 beautiful homes and a community of diverse people including singles, families and retirees. The luxurious homes in Sterling Hills typically have 3 bedrooms and have around 1,130 square feet of living space. Depending upon the property’s age, size, style, location and special features prices vary but are usually in the $100,000 to $170,000 range. If you would like more information regarding homes for sale in Sterling Hills, or if you have questions regarding other real estate options in Lee’s Summit, Missouri, please do not hesitate to contact us today. Listing courtesy of Joe Hedges of Chartwell Realty LLC.